Work wrapped up at the east end of Tradd Street just minutes before the onset of yet another late afternoon thunderstorm. In spite of the lingering presence of ominous clouds, the student archaeologists working at the site made some significant headway today. Continuing to excavate the soil on the south side of the colonial redan wall, the students revealed a surprising view of the condition of the “nose” of the redan. As you can see in the photos below, there are a couple of significant voids in the extreme tip of the redan, to the north and to the south of the apex. We don’t know the cause of these voids, but the archaeologists will have to exercise caution when working in the soil around the apex from now on. 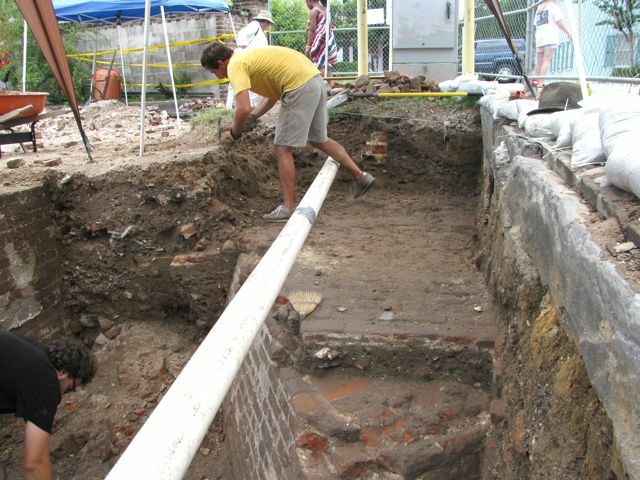 Just a few few to the west, other students were busy removing the soil of another excavation unit in order to reveal more of the 1786 floor of the Lower Market (see the photo above right). As that work continues southward tomorrow, we’ll also begin to see more of the westward continuation of the redan wall. On Day 10 of the dig I mentioned a patch of “mystery” bricks located a few feet to the south of the redan apex. 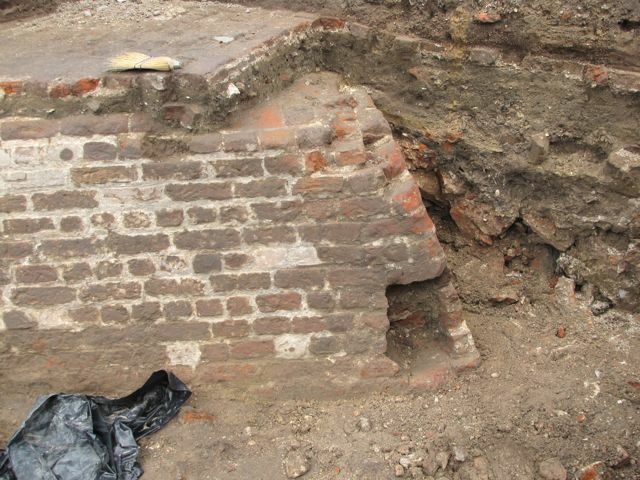 Further exploration of that area has revealed the outline of a large mass of bricks and something resembling concrete (see the photo at right). 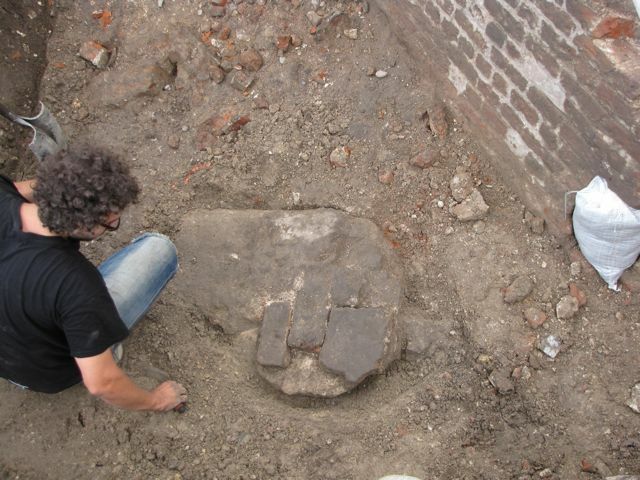 We suspect that this mass is a large fragment of the upper wall of the redan, similar to parts of the wall embrasure that we saw in 2008 during the South Adger’s Wharf dig. 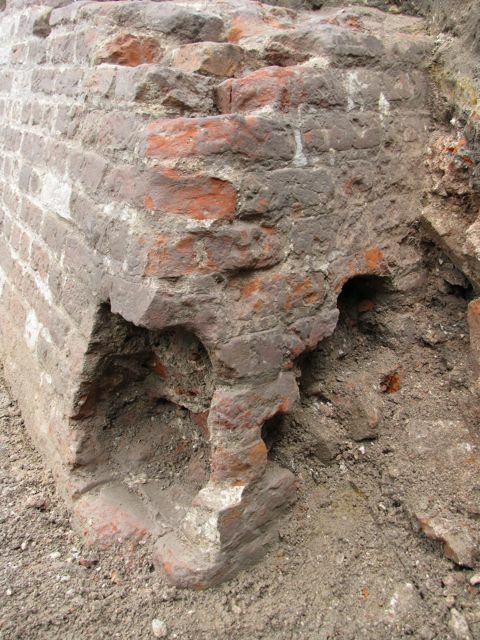 In the next few days, as the students continue to work downward along the south face of the redan, we’ll be dealing with this and other large chunks of the wall that tumbled into the mud when the upper parts of the redan were demolished in late 1784 or early 1785. Finally, I’ll mention a few interesting artifacts unearthed today. 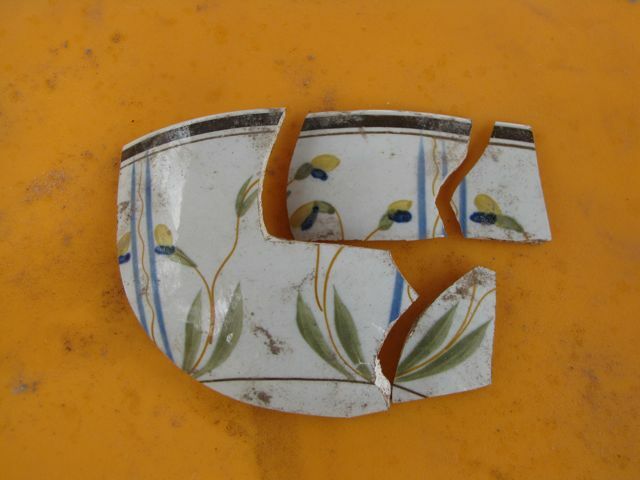 While expanding a unit and removing the soil located above the level of the redan, students discovered several fragments of a hand-painted polychrome (multicolor) bowl. The archaeologists tell me that this material, seen in the photo to the left, dates from the era of approximately 1780 to 1820. 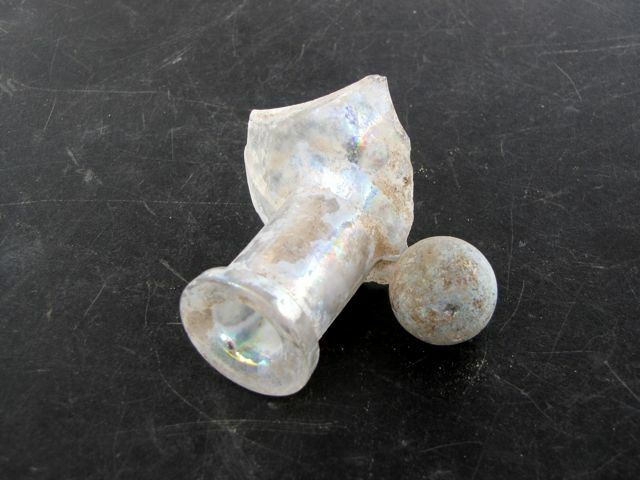 Similarly, today’s sifting also revealed a beautiful fragment of an early-nineteenth century medicine bottle, as well as a small glass marble. These two items, pictured at right, represent a later occupation of this site than the colonial-era artifacts found next to the redan, but they are still beautiful reminders of life in earlier generations.